Galen is a world-class fisherman with the heart of a teacher. He is fully licensed by the state of Wisconsin, and he is certified by the United States Coast Guard as a Master Captain. 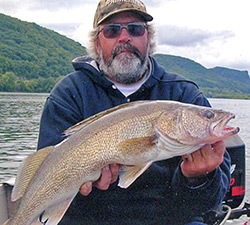 His over ten years of experience on the Walleye Angler Trail has netted him many hundreds of catches. After so many championships, Galen decided to pass on his knowledge and become a fishing guide on the legendary Mississippi River and Wisconsin River. Galen is a seven-time qualifier for Cabelas' National Championship. He won second in the FLW championship at Winona, Minnesota. Three times he won "Team of the Year" at the Walleye Angler Trail. Last year, he qualified for nationals in Malax, MN and won "Team of the Year" in the Mighty Miss Walleye Series. Below is the complete list of tournaments that Galen has participated in.